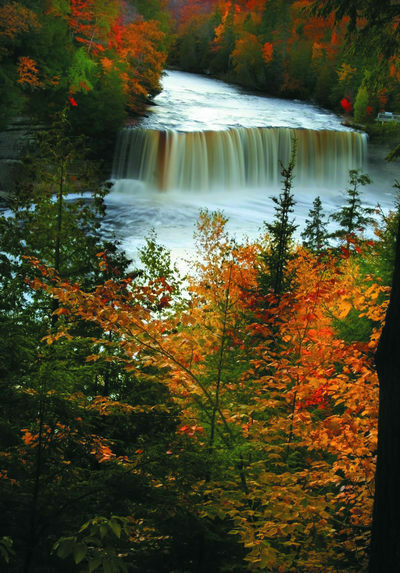 Home > Attractions > Waterfalls of the U.P. The U.P. is home to all but one of Michigan’s waterfalls. There are more than 300 falls scattered across the U.P., ranging in size from under 5 feet to 48+ feet vertical drops. Almost all require hiking to reach, but there are paths (several barrier-free) to some of the most popular. The best time to see them is in spring when even the smallest falls roar to life. They are also beautiful in winter and, if you’re up to the challenge, try ice climbing (Munising and Miners Falls are favorite columns of ice to scale).